Does your countertop need repair? Whether you have granite, marble, corian, or another solid surface countertop, the Fixit Pros can help. Have countertop damage? Take a picture and upload it here. 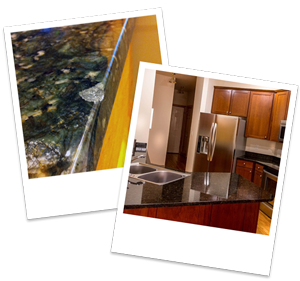 Include your basic information and submit for a countertop damage quick estimate! Whatever your countertop repair or countertop refinishing needs are, our FixIt Pros can help. If you have damage to your granite countertops, quartz countertops, or solid surface countertops you’ve come the right place. FixIt Countertops has been in the countertop industry for more than 20 years and our FixIt Pros all have backgrounds as countertop fabricators and installers of solid surface, engineered stone, and natural stone countertops, so you can feel confident that you have the most experienced professional servicing your countertops.